The night we’ve prayed and meticulously planned for the last few months has quickly come and gone. Thank you to everyone who was able to come. Some of our guests were introduced to ACF for the first time, while others were deep-rooted, long-time supporters. For those who were unable to attend, here is a quick recap of our wonderful night. We kicked off the night with a video that highlighted the exciting moments and blessings of 2018. Click here to watch the video. Our MCEE for the night was the one and only Scott Shaeffer who is the founder of One Voice that seeks to unite the body of Christ within the Quad Cities. Scott welcomed all in attendance and shared that the theme of Reach this year is foundations. ACF strives to raise the children we’ve been called to serve upon the firm foundation of Jesus Christ according to Luke 6:47-48. 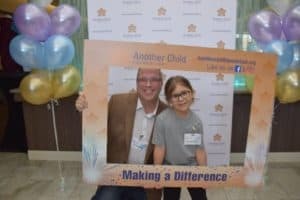 Scott introduced Director and co-founder of Another Child Foundation, Tim Oloffson, who gave a brief summary of how ACF began and its mission to reach, teach, and transform the lives of the children God has entrusted in our hands. Pastor Steve Palm from Geneseo Evangelical Free Church was our next speaker. 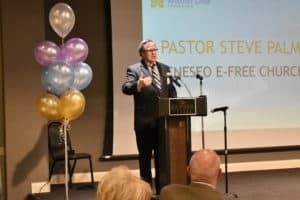 He gave an impassioned description of the discrimination and hardships of Roma people and a call to action reminding Christians that God has called us to not simply serve locally but also globally. Next, our guests were blessed to watch a powerful video of our precious Point of Hope children that you can see here. Jessica Huettel from Huston, Texas was our featured speaker. She is a kindergarten teacher and advocate for children. 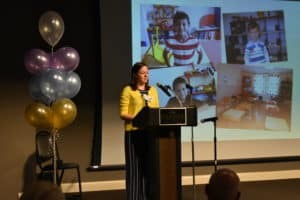 She reminds her students daily that, “You are capable, and you can do big things!” She did an internship at the Point of Hope and has led several ACF mission trips. We are extremely grateful for her as an integral member of our board and close friend to ACF. She is organizing a trip in June with several other U.S. teachers. They are putting together a science camp for our kids and plan to sit down with P.O.H. teachers to give them helpful advice and see what materials they need to better equip them in their ministry. After Jessica graced us with her heartfelt testimony, Tim informed us that Reach was focused on raising money to provide necessary support for our amazing teachers at the P.O.H. They are the ones in the trenches of our ministry. In order to most effectively pour into the lives of our students, they must be refreshed spiritually and equipped with the best training and resources to reach our children, many who have lived through extreme trauma. 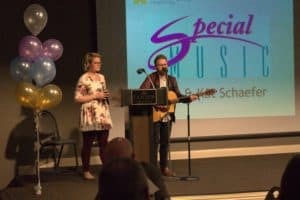 While our generous supporters filled out their donation cards, they enjoyed delicious cupcakes and a beautiful song performed by Nate and Kat Schaeffer. We ended the night by recognizing our child sponsors. Without them, Another Child Foundation wouldn’t be possible. Because of their dedicated generosity, hundreds of children’s destinies will be forever changed for good, and they now know that they too are capable and can do big things!